SAN DIEGO - The Boxer Amphibious Ready Group (BOXARG) is scheduled to return April 25 to Naval Base San Diego from an eight-month deployment. UPDATE: Catch the homecoming live via streaming video on the Navy Live Blog beginning at 7:30 a.m. Pacific Standard Time on April 25. 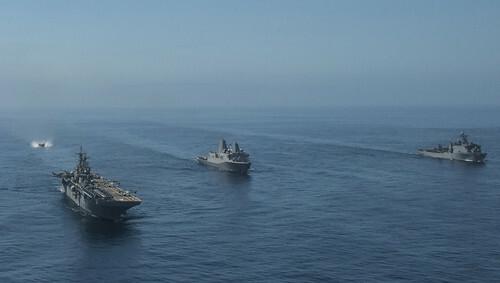 BOXARG is made up of amphibious assault ship USS Boxer (LHD 4), amphibious transport dock ship USS New Orleans (LPD 18), and amphibious dock landing ship USS Harpers Ferry (LSD 49). While deployed, they operated with embarked forces of the 13th Marine Expeditionary Unit, and the "Black Jacks" of Helicopter Sea Combat Squadron (HSC) 21, Detachment 3, as well as detachments from Assault Craft Unit (ACU) 1 and ACU 5. BOXARG is returning from a successful deployment to the Western Pacific and the Arabian Gulf where they maintained a crisis response capability and performed presence operations. Additionally, they undertook numerous maritime security operations, seven major theater security cooperation efforts, and other operational support in the U.S. 5th, 6th, and 7th Fleet areas of responsibility. This deployment marked the first west coast Amphibious Ready Group to bring a complement of MV-22 Ospreys, operating together for the first time with the UH-1 Iroquois command/control helicopter and the AH-1 Cobra attack helicopter.